Chenopodium berlandieri, also known by the common names pitseed goosefoot, huauzontle, lamb's quarters, and lambsquarters is an annual herbaceous plant in the goosefoot family. The species is widespread in North America, where its range extends from Canada south to Michoacán, Mexico. It is found in every U.S. state except Hawaii. The fast-growing, upright plant can reach heights of more than 3 m. It can be differentiated from most of the other members of its large genus by its honeycomb-pitted seeds, and further separated by its serrated, more or less evenly lobed lower leaves. Although widely regarded as a weed, this species was once one of several plants cultivated by Native Americans in prehistoric North America as part of the Eastern Agricultural Complex. C. berlandieri was a domesticated pseudocereal crop, similar to the closely related quinoa C. quinoa. It continues to be cultivated in Mexico as a pseudocereal, as a leaf vegetable, and for its broccoli-like flowering shoots. Chenopodium seeds vary in shape between lenticular and cylindrical. The lenticular shape is more typical of wild members of the species while cylindrical seeds (said to have a "truncated margin") predominate in domesticated varieties. The nutritive perisperm tissue is encircled by the embryo along the seed margin. The radicle protrudes slightly, producing a visible bump in the circumference of the seed (called the "beak"). Surrounding the perisperm and embryo are three layers: the inner epiderm, the outer epiderm, and the pericarp. The inner epiderm is also called a tegmen. The outer epiderm is synonymous with testa. Together, the outer and inner epiderm make up the seed coat. In Chenopodium literature, the terms outer epiderm, testa, and seed coat are often used interchangeably. The pericarp is often dehiscent, but is non-dehiscent in some varieties. In domesticated varieties, the seed coat may be reduced or absent. Uniform seed assemblages with seed coats less than 20 µm thick are considered to represent domesticated population. Conversely, wild populations tend to produce seeds with seed coat thicker than 20 µm. The species includes two subspecies: the type subspecies (i.e. C. b. ssp. berlandieri) and C. b. ssp. nuttalliae. The latter, which also goes by the common names huauzontle, huauthili and Nuttall's goosefoot, is a domesticated variety cultivated in Mexico. 'Huauzontle' - This cultivar is a more recent selection used in commercial cultivation for a broccoli-like crop. It is a "naked" variety and has a testa only 2-7 µm thick (cf. human hair, which is about 100 µm wide). 'Chia' - Grown as a grain crop, this cultivar is declining and is cultivated only on a local level. It also has a very thin testa, though slightly thicker than the previous at 10-20 µm. 'Quelite' - This cultivar is cultivated for its spinach-like leaves. The species is capable of hybridizing with the related introduced European Chenopodium album, which it resembles, giving the hybrid C. × variabile Aellen. C. berlandieri is the progenitor of all domesticated Chenopodium varieties in North and South America. In prehistoric eastern North America it was a part of the Eastern Agricultural Complex, a set of cultivated and domesticated species which supported sedentary and migrant populations for thousands of years. Archaeological evidence shows the species was extensively foraged as a wild plant in eastern North America as early as 6,500 BC. By 1700 BC, the plant had clearly been domesticated as a pseudocereal crop. The name given to the domesticated variety is C. b. ssp. jonesianum. The oldest evidence for domestication comes from caches of thin-testa seeds from rock shelters in the Ozark Plateaus and Ohio River basin. The goosefoot ceased to be cultivated in most of eastern North America around the time of European contact. The only known potential historic record of C. b. ssp. jonesianum is a c.a. 1720 account by Antoine Simon Le Page du Pratz. According to Le Page, the Natchez people cultivated a grain-like crop called Choupichoul that was delicious, nutritious, highly productive, and required minimal human labor. Multiple lines of evidence suggest that the crop was a domesticated variety of C. berlandieri. Although cultivation disappeared in eastern North America, C. b. subsp. nuttalliae continues to be cultivated as a domesticated crop in Mexico. Three varieties of the subspecies are grown as a pseudocereal, as a leaf vegetable, and for its broccoli-like flowering shoots, respectively. The principal difference between wild and domesticated forms of Chenopodium is the thickness of the seed coat. In the domesticated varieties, due to selective pressures during domestication, the testas are less than 20 microns thick; the testas of wild chenopods are 40 to 60 microns thick. This morphological characteristic is shared by the modern cultivated chenopod C. b. subsp. nuttalliae and the archaeological specimens of C. b. ssp. jonesianum. Genetic studies have shown that eastern North American and Mexican cultivated forms have considerable genetic distance between them. Despite the initial assumption of a single domestication event, consensus in the field now supports at least two independent domestication events in North America. Similarly, C. berlandieri's South American branch likely experienced at least two independent domestication events, both of which are called C. quinoa. 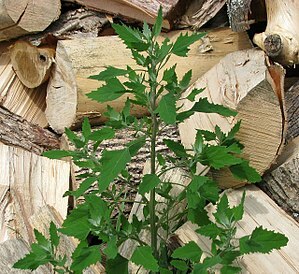 Chenopodium berlandieri growing near a pile of wood in Ontario, Canada. 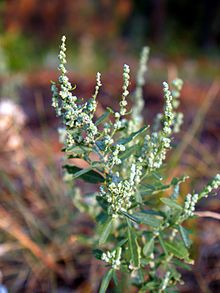 Chenopodium species have been implicated among the greatest weed threats to agriculture in North America and globally. Most research cites the European species C. album as an herbicide resistant weed threat. The weed status and herbicide tolerance of C. berlandieri is unclear due to difficulty distinguishing species within the subsections Leiosperma (i.e C. album ) and Cellulata (i.e. C. berlandieri). As the cultivation of quinoa has spread globally, it has entered geographic regions with extant wild populations of close relatives including C. berlandieri in North America and C. album elsewhere. Proximity of the species allows cross-pollination and the formation of a crop-weed complex. Genetic introgression is often degenerative for both crops and wild plants; however, it can also be an opportunity to develop new crop varieties. Remarkably, the emerging quinoa and C. berlandieri crop-weed complex reflects the prehistoric genetic interaction of domesticated and wild chenopods in eastern North America. ^ a b c Wilson, Hugh D. (1990-07-01). "Quinua and Relatives (Chenopodium sect.Chenopodium subsect.Celluloid)". Economic Botany. 44 (3): 92–110. doi:10.1007/BF02860478. ISSN 0013-0001. ^ a b c Jarvis, David E.; Ho, Yung Shwen; Lightfoot, Damien J.; Schmöckel, Sandra M.; Li, Bo; Borm, Theo J. A.; Ohyanagi, Hajime; Mineta, Katsuhiko; Michell, Craig T. (February 2017). "The genome of Chenopodium quinoa". Nature. 542 (7641): 307–312. doi:10.1038/nature21370. ISSN 1476-4687. PMID 28178233. ^ Fritz, Gayle J.; Bruno, Maria C.; Langlie, BrieAnna S.; Smith, Bruce D.; Kistler, Logan (2017). Social Perspectives on Ancient Lives from Paleoethnobotanical Data. Springer, Cham. pp. 55–75. doi:10.1007/978-3-319-52849-6_3. ISBN 9783319528472. ^ a b c d e f g h i Smith, Bruce D. (2007). Rivers of change : essays on early agriculture in eastern North America. Cowan, C. Wesley, 1951-, Hoffman, Michael P. Tuscaloosa: University of Alabama Press. ISBN 978-0817354251. OCLC 712992803. ^ a b c d Gremillion, Kristen J. (July 1993). "Crop and Weed in Prehistoric Eastern North America: The Chenopodium Example". American Antiquity. 58 (3): 496–509. doi:10.2307/282109. ISSN 0002-7316. JSTOR 282109. ^ a b c Gremillion, Kristen J. (1993). "The evolution of seed morphology in domesticated Chenopodium: an archaeological case study". Journal of Ethnobiology. 13: 149–169. ^ a b Asch, David L; Asch, Nancy B (1977). "Chenopod as cultigen: A re-evaluation of some prehistoric collections from eastern North America". Midcontinental Journal of Archaeology: 3–45. ^ a b c d e Smith, Bruce D. (2006). "Eastern North America as an Independent Center of Plant Domestication". Proceedings of the National Academy of Sciences of the United States of America. 103 (33): 12223–12228. doi:10.1073/pnas.0604335103. PMC 1567861. PMID 16894156. ^ "Chenopodium berlandieri Moq". Germplasm Resources Information Network (GRIN). Agricultural Research Service (ARS), United States Department of Agriculture (USDA). Retrieved 2009-01-03. ^ a b Smith, Bruce D. (1985). "CHENOPODIUM BERLANDIERI SSP. JONESIANUM: EVIDENCE FOR A HOPEWELLIAN DOMESTICATE FROM ASH CAVE, OHIO". Southeastern Archaeology. 4 (2): 107–133. JSTOR 40712807. ^ a b Kistler, Logan; Shapiro, Beth (2011-12-01). "Ancient DNA confirms a local origin of domesticated chenopod in eastern North America". Journal of Archaeological Science. 38 (12): 3549–3554. doi:10.1016/j.jas.2011.08.023. ^ Kolano, Bozena; McCann, Jamie; Orzechowska, Maja; Siwinska, Dorota; Temsch, Eva; Weiss-Schneeweiss, Hanna (2016). "Molecular and cytogenetic evidence for an allotetraploid origin of Chenopodium quinoa and C. berlandieri (Amaranthaceae)". Molecular Phylogenetics and Evolution. 100: 109–123. doi:10.1016/j.ympev.2016.04.009. PMID 27063253. ^ a b c Smith, Bruce D.; Yarnell, Richard A. (2009-04-21). "Initial formation of an indigenous crop complex in eastern North America at 3800 B.P". Proceedings of the National Academy of Sciences. 106 (16): 6561–6566. doi:10.1073/pnas.0901846106. ISSN 0027-8424. PMC 2666091. PMID 19366669. ^ Fritz, Gayle J. (2014). "Eastern North America: An Independent Center of Agricultural Origins". In Smith, Claire. Encyclopedia of Global Archaeology. Springer New York. pp. 2316–2322. doi:10.1007/978-1-4419-0465-2_2194. ISBN 9781441904263. ^ Le Page du Pratz, Antoine S. (1758). Histoire de la Louisiane. Paris. ^ Wilson, Hugh D. (1981-04-01). "DomesticatedChenopodium of the Ozark Bluff Dwellers". Economic Botany. 35 (2): 233–239. doi:10.1007/BF02858690. ISSN 0013-0001. ^ Risi, J. C.; Galwey, N. W. (1989-04-01). "The pattern of genetic diversity in the Andean grain crop quinoa (Chenopodium quinoa Willd). I. Associations between characteristics". Euphytica. 41 (1–2): 147–162. doi:10.1007/BF00022424. ISSN 0014-2336. ^ Wilson, Hugh D. (1988-10-01). "Quinua biosystematics I: Domesticated populations". Economic Botany. 42 (4): 461–477. doi:10.1007/BF02862791. ISSN 0013-0001. ^ Heap, Ian (2014). "Herbicide Resistant Weeds". Integrated Pest Management. Springer, Dordrecht. pp. 281–301. doi:10.1007/978-94-007-7796-5_12. ISBN 9789400777958. ^ Thiel, Heike; Varrelmann, Mark (2014-02-01). "Identification of a new PSII target site psbA mutation leading to D1 amino acid Leu218Val exchange in the Chenopodium albumD1 protein and comparison to cross-resistance profiles of known modifications at positions 251 and 264". Pest Management Science. 70 (2): 278–285. doi:10.1002/ps.3556. ISSN 1526-4998. PMID 23576399. ^ Gibson, David J; Young, Bryan G; Owen, Micheal DK; Gage, Karla L; Matthews, Joseph L; Jordan, David L; Shaw, David R; Weller, Stephen C; Wilson, Robert G (2016-04-01). "Benchmark study on glyphosate-resistant cropping systems in the United States. Part 7: Effects of weed management strategy (grower practices versus academic recommendations) on the weed soil seedbank over 6 years". Pest Management Science. 72 (4): 692–700. doi:10.1002/ps.4039. ISSN 1526-4998. PMID 25974869. ^ Rahman, Anis; James, Trevor; Trolove, Michael (2014-06-01). "Characteristics and control of dicamba-resistant common lambsquarters (Chenopodium album)". Weed Biology and Management. 14 (2): 88–98. doi:10.1111/wbm.12036. ISSN 1445-6664. ^ Wilson, Hugh D. (1980). "Artificial Hybridization Among Species of Chenopodium sect. Chenopodium". Systematic Botany. 5 (3): 253–263. doi:10.2307/2418372. JSTOR 2418372. ^ Ohri, Deepak (2015-08-01). "The taxonomic riddle of Chenopodium album L. complex (Amaranthaceae)". The Nucleus. 58 (2): 131–134. doi:10.1007/s13237-015-0143-2. ISSN 0029-568X. ^ Wilson, H.; Manhart, J. (1993-06-01). "Crop/weed gene flow:Chenopodium quinoa Willd. andC. berlandieri Moq". Theoretical and Applied Genetics. 86 (5): 642–648. doi:10.1007/BF00838721. ISSN 0040-5752. PMID 24193715. ^ Jenczewski, Eric; Ronfort, Joëlle; Chèvre, Anne-Marie (2003). "Crop-to-wild gene flow, introgression and possible fitness effects of transgenes". Environmental Biosafety Research. 2 (1): 9–24. doi:10.1051/ebr:2003001. ISSN 1635-7922. PMID 15615064. ^ Darmency, H. (1994-02-01). "The impact of hybrids between genetically modified crop plants and their related species: introgression and weediness". Molecular Ecology. 3 (1): 37–40. doi:10.1111/j.1365-294X.1994.tb00040.x. ISSN 1365-294X. ^ Mueller, Natalie G.; Fritz, Gayle J.; Patton, Paul; Carmody, Stephen; Horton, Elizabeth T. (July 2017). "Growing the lost crops of eastern North America's original agricultural system". Nature Plants. 3 (7): 17092. doi:10.1038/nplants.2017.92. ISSN 2055-0278. PMID 28696428. ^ Jarvis, Devra I.; Hodgkin, Toby (1999-12-01). "Wild relatives and crop cultivars: detecting natural introgression and farmer selection of new genetic combinations in agroecosystems". Molecular Ecology. 8: S159–S173. doi:10.1046/j.1365-294X.1999.00799.x. ISSN 1365-294X. Wikimedia Commons has media related to Chenopodium berlandieri. This page was last edited on 21 February 2019, at 10:59 (UTC).